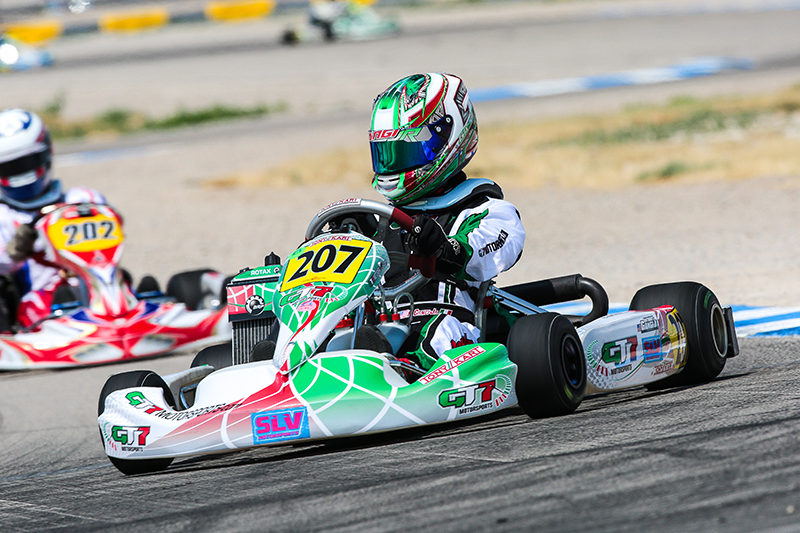 With hopes to join Team USA at the annual Rotax MAX Challenge Grand Finals (RMCGF), GT7 Motorsports driver Anthony Gangi Jr. would compete in the Rotax Junior class at the recent 2014 Cold Stone US Grand Nationals. Showing speed around the ultra-fast and technical Miller Motorsports Park in Tooele, Utah, the up-and-coming talent was one of the youngest drivers in the ultra-competitive Junior Max class, at only 12 years of age. Gangi Jr. would be the driver to beat throughout the weekend until the Championship Sunday main event, when heartbreak would strike the junior competitor. Progressing through the unofficial and official practice days, Friday morning would bring qualifying for the Rotaxians and Gangi Jr. was on pace. Competing in the Rotax Junior field and claiming a top-six result in the first round of qualifying, the Tony Kart driver would be invited to compete in the Rotax Junior SuperPole session. With a green, white, checkered and the best lap to garner the pole position, Gangi Jr. would end the session P3 and start all three of his heat races from the front row. The first heat of the weekend would take place on Friday afternoon and Gangi Jr. would flex his muscles from the opening lap. Taking the point and working hard to achieve the victory, the GT7 Motorsports driver would go on to take the victory ahead of a field of talented drivers. Back to the track on Saturday morning for heat two, the second of three heats would be a carbon copy for Gangi Jr. as he once again went on to take the win. In control of the point standings entering heat three, the multi-time champion worked hard to stay at the front of the field. Battling for position, Gangi Jr. would end his third and final heat in the second position. With heat points calculated and the starting grid for the prefinal based upon these points, Gangi Jr. would secure the pole position for Championship Sunday and start the day’s prefinal from inside row one. Championship Sunday would start off good for the New Yorker, as a good morning warm-up would result in a strong start in the prefinal. Unable to stay at the very front of the field, Gangi Jr. would make the best of his package and salvage a solid second place result. Beginning his quest for a national title and spot on Team USA, Gangi Jr. would start the long main event from the front row. A tough start in the main event would see Gangi Jr. fall to fourth on the opening lap, but that is where he would begin his march forward. Circulating the Miller Motorsports Park track with determination, the talented 12-year-old would methodically work his way forward. Moving to the third position on lap four and the second position on lap eleven, the Tony Kart driver was well on his way to a podium result before disaster would strike. Anthony Gangi Jr. would like to thank Team GT7, tuner/driving coach Thomas Silva, Disco Dan for the always great power as well as sponsors GT7 Motorsports, Millwork Solutions, Hole Shot Drive Systems, PKT, and Hot Head Engine Preheaters. The GT7 Motorsports Team is a proud Tony Kart and Vortex engine dealer for the US North East. For more information on Anthony Gangi Jr. please check out his website at www.gangijr.com. For more information GT7 Motorsports please visit their website www.GT7motorsports.com or contact Anthony Gangi Sr. at 516-635-8594 or email at agangi@mac.com.